On the day it released a significant amount of the powerful greenhouse gas methane into the atmosphere, UK fracking firm Cuadrilla’s air monitoring equipment suddenly stopped working. The instrument malfunction occurred on the afternoon of January 14th, with the instrument replaced the following morning, though ‘the data source was not fully restored until several hours later’. The malfunction came on that same day that Cuadrilla attempted to flare gas at its shale site but could not set it alight due to its low methane content. It follows an event in early November when the driller used propane to help light its flare since gas flows were so low, though the firm describes its use as a ‘standard feature’ in the industry. Whilst Cuadrilla didn’t capture much by way of readings at the time (see above), data captured by British Geological Survey (BGS) monitors show methane levels exceeded 10ppm that day, far higher than previous readings at the site excluding a one-time methane reading of 70ppm, considered by experts to be anomalous. The data gap in mid-January amounted to 22 hours, with the instrument down for approximately 16 hours before a brief ‘telecommunications issue,’ according to Cuadrilla. On its website, Cuadrilla claims methane levels were ‘observed to be at background levels (2ppm) during this period.’ The BGS data also showed methane levels returning to the mean that evening. Methane is roughly 30 times more potent a greenhouse gas than carbon dioxide but has a much shorter lifetime in the atmosphere. How much methane is a lot of methane? Dr Grant Allen from Manchester University likened the peak emission from Cuadrilla’s methane release to the peak emission at a dairy farm or landfill site. Because commercial fracking is not yet underway – this is just an exploratory well – it is impossible to calculate for sure how much methane might be released into the atmosphere during drilling operations. A widely-cited statistic is that the climate gains of swapping coal for gas power are undone if more than 3% of the gas is lost to the atmosphere. It’s highly unlikely that the UK shale sector will release or fail to capture that amount — even the relatively poorly-regulated US gas industry sees methane leakage between 1.4 and 2.3%, though some scientists claim the true figure is higher. 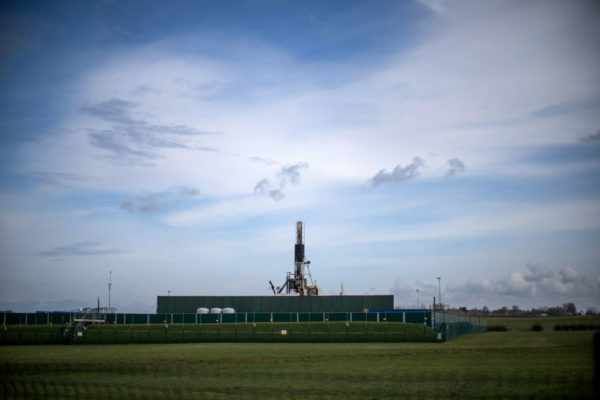 The UK’s own climate targets would require shale gas to be far more than just ‘better than coal,’ with the Committee on Climate Change (CCC) saying in 2016 the fracking industry would need to meet tough rules on methane emissions, limiting gas throughput to roughly 0.5%. That was before the government started consulting on a net zero emissions target which could lower the acceptable level of methane leakage still further. Last year ‘father of climate science’ James Hansen hit out at the British government for its fracking plans, citing methane concerns. He told the Guardian: “If the UK were to join the US by developing gas fields at this point in time it will lock in the methane problem for decades.